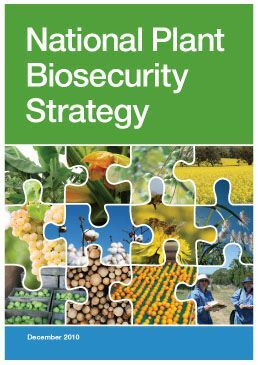 The National Plant Biosecurity Strategy (NPBS) is a comprehensive ten year plan that points the way for governments, plant industries and the community to work closely together to strengthen Australia’s plant biosecurity system. In presenting a vision for the national plant biosecurity system, the NPBS looks at the challenges Australia will need to overcome in the next ten years and what steps will need to be taken. Realisation of this vision will better protect Australia and Australians from the negative impacts of plant pests, benefit market access for plant products, sustain Australia’s high quality and reliable food supply, and preserve environmental health and amenity. The NPBS is the culmination of more than three year’s work by PHA who formulated the strategy on behalf of its members and in close consultation with hundreds of expert stakeholders across Australia’s plant biosecurity system. Importantly the NPBS has been the endorsed by the Australian Government, state and territory governments and PHA industry members, which paves the way for increased cooperation between governments and plant industries in plant biosecurity. support long term sustainable production practices. Click here to download a summary of the strategy’s main findings. 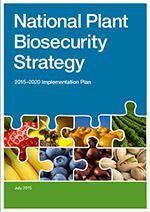 The National Plant Biosecurity Strategy (NPBS) sets the strategic direction for the plant biosecurity system to 2020. 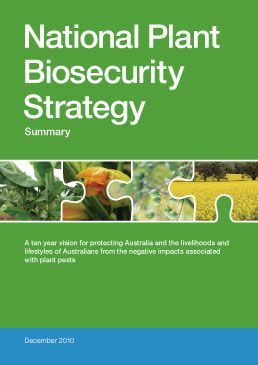 It incorporates high level strategies for the key functional areas of emergency response, diagnostics, surveillance and communications, and involves most stakeholders with a shared responsibility and commitment to the plant biosecurity status of Australia. In 2014–15, PHA reviewed the NPBS and produced a report card on the implementation of the strategy, halfway to its target of 2020. It was found that many recommendations and strategies have been progressed and some completed. The gaps still remaining were identified and compiled into a table with suggested priorities assigned for stakeholders. All stakeholders agreed that the strategy is still current and PHA will continue to work with all industry and government stakeholders to support ongoing implementation during 2016-20. The results of the review and the activities yet to be completed are in the National Plant Biosecurity Strategy 2015–2020 Implementation Plan. The following section presents strategies, recommendations and actions for achieving an internationally outstanding plant biosecurity system capable of supporting sustainable plant production and environmental health while maintaining and enhancing market access.